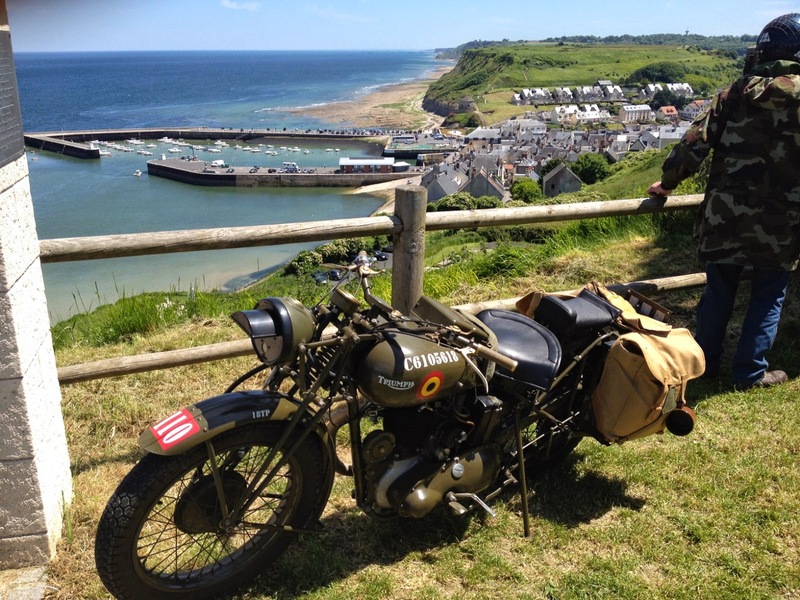 Does anybody recognise this bike? 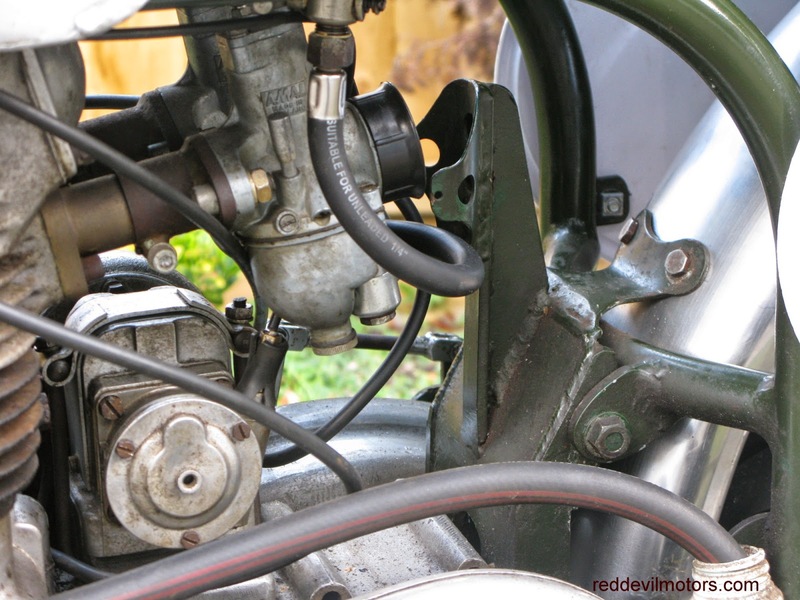 The engine is a Royal Enfield 500 twin from the early fifties, it has no number stamped. 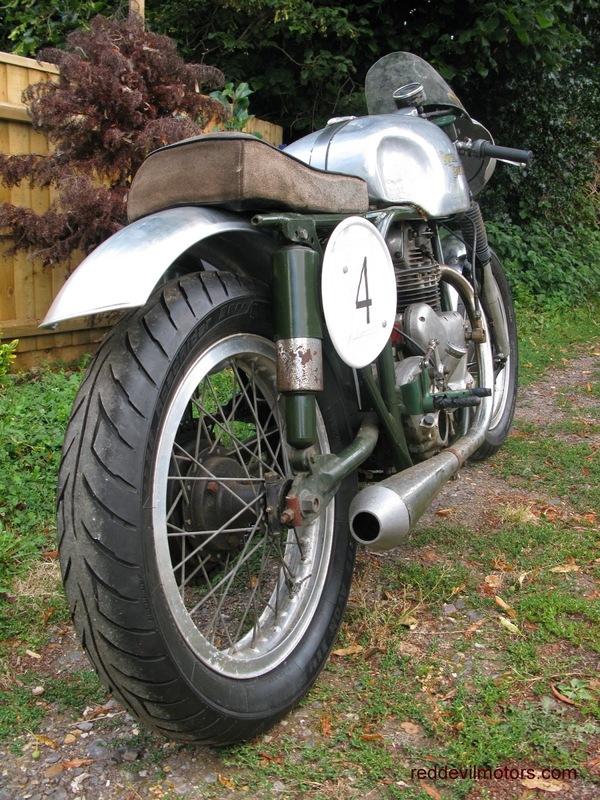 The frame looks like a Norton but is in fact a one off in the style of a featherbed. The build of the frame is a work of art, beautifully executed with a lot of very nice attention to detail. 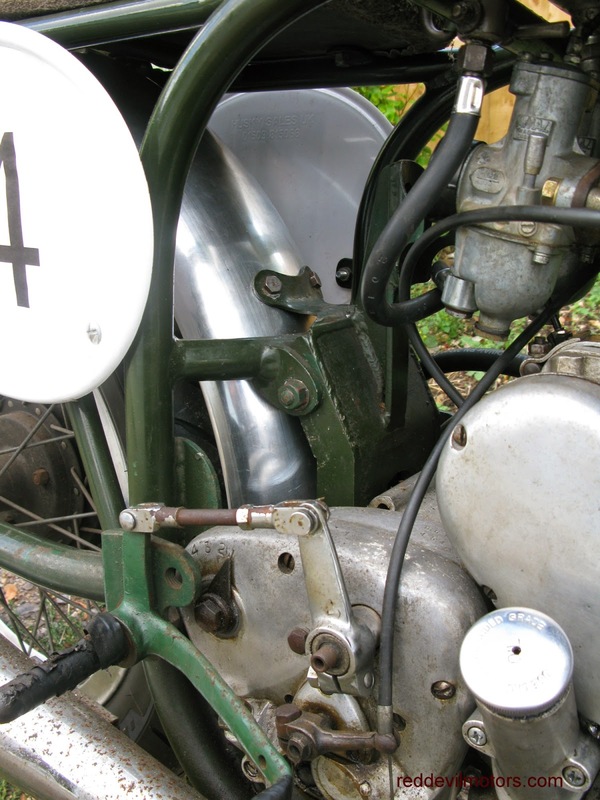 Forks are Enfield with a one off top yoke. Wheels are also Enfield and the gearbox is an Albion stamped HCR 454 which I would guess stands for 'high close ratio'. 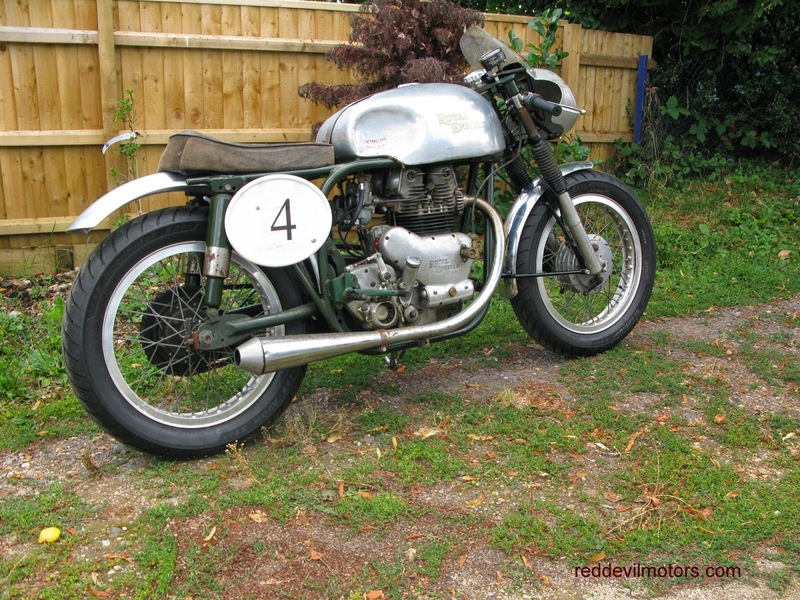 I believe the machine is from the early fifties and was built at a time when pukka race bikes were hard to get and featherbed frames were not available on the open market. The bike has a dealer sticker on the frame top rail 'Tony Cooper Motorcycles' of Dudley, this dates from the seventies. 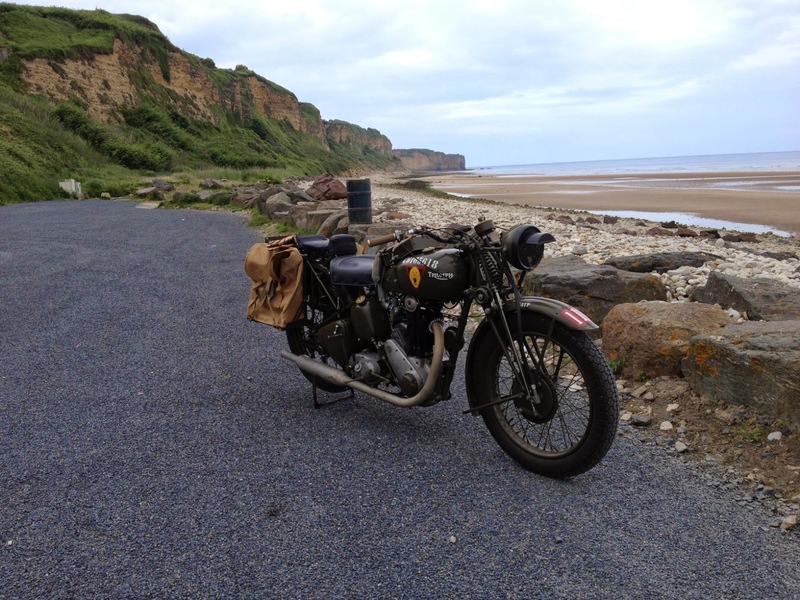 Apparently TCM bought the bike from the James Brothers at the Old Railway Station in Baschurch, Shropshire. I had a lead that it might have been built by a guy called Geoff Rawlings in Filton, Bristol from someone who possibly remembered it as a child. 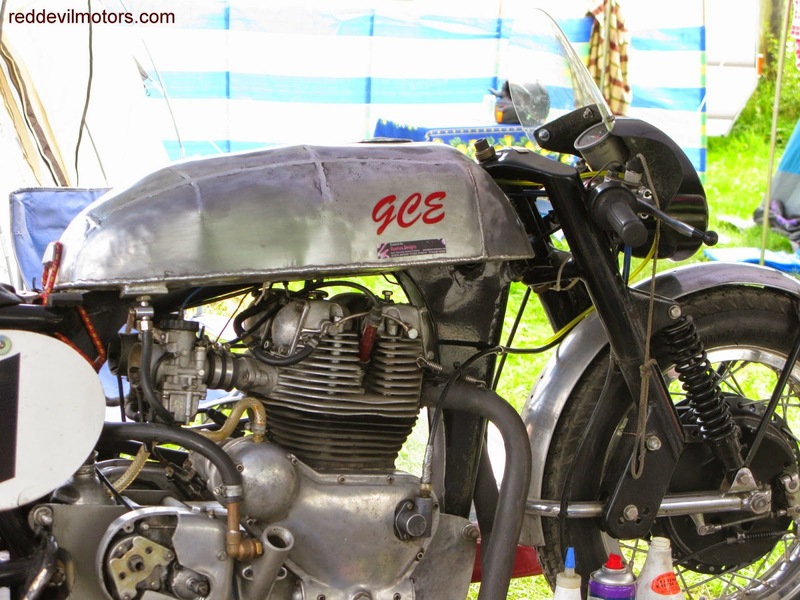 The other lead was from a guy I met at the VMCC Wroughton Sprint a few years ago when I took the bike along, he recognised it as a machine he had worked on and it had belonged to a friend of his but he had no further history. 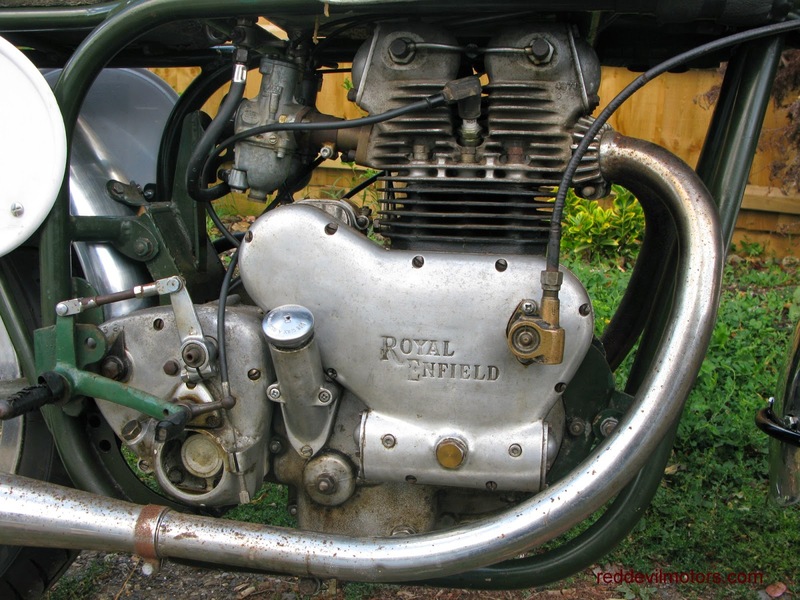 I would love to know more of the Enfield's history, for it must surely have an interesting past. My story with it begins nearly ten years ago when I bought it at auction in the West Country, unloved by other bidders and hammered down to my solitary speculative hand in the air. It sat at the back of the garage for a while whilst I pondered what to do with it, time went by, we moved house and then I realised I wasn't going to easily find the time to sort it out. I got in touch with Paul Henshaw of Performance Classics who agreed to rebuild the motor for me. I had run it but just for a few seconds but was nervous of running it longer as it had been using Castrol R and was left standing for a lengthy time, there was a chance that serious use could result in mechanical disaster from blocked up oilways. Paul did a great job on the engine for very reasonable money and I collected a sweet running bike. He was even kind enough to do some enquiries about its history but mostly drew a blank. There followed several months, time was short, but I managed to take it to a VMCC sprint at Wroughton. 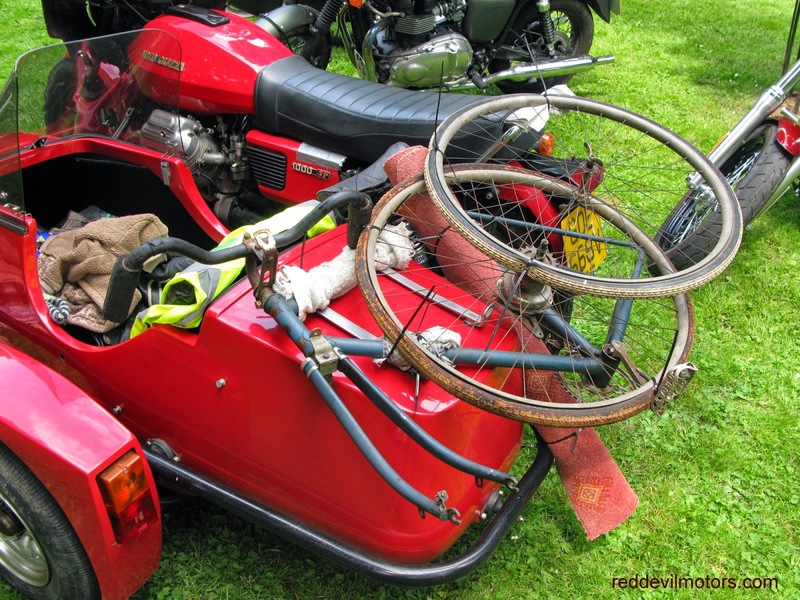 The bike started sweetly but wouldn't pull under load, a sign of ignition or more likely fuel woes from storage. Then we moved house, the shed at the new place started leaking and the Enfield had to be evacuated to safer storage. 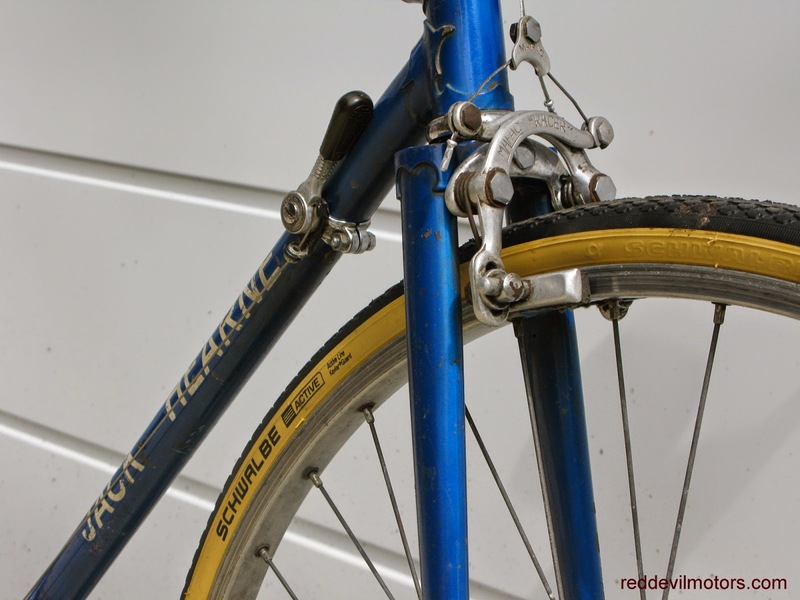 Classic fifties race bike lines. There's now a grander and rain tight shed been built and the Enfield has come home. I've realised I am not going to get much use with it out on the track so it is getting prepped for road use. It has been registered on an age related number with DVLA and is getting a few light modifications to make it closer to road legal. The front mudguard has been added courtesy of Hitchcocks motorcycles. 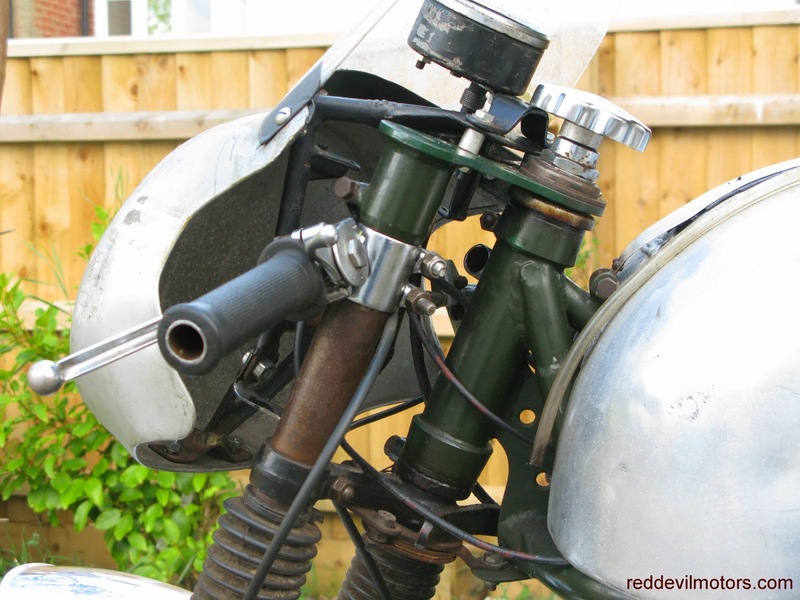 I made a frankenstein side stand from a sidecar mount grafted on to an Indian Enfield stand and it still needs a bulb horn to be discretely tucked away somewhere. Nice detailing on the one-off frame. I've made one or two minor cosmetic changes. 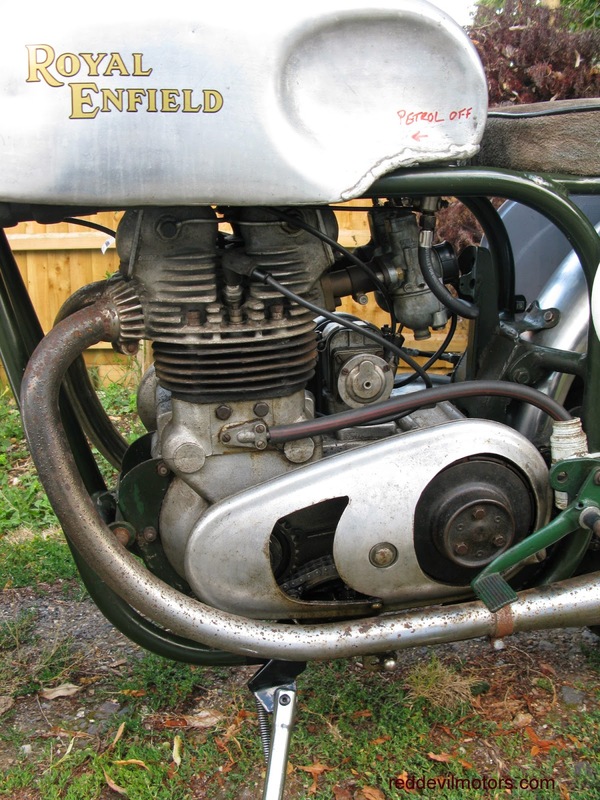 When the Enfield came to me it had flat handlebars and looked as if it had been used for hill climbing. I removed these bars and fitted a pair of clip ons which look a lot more graceful. 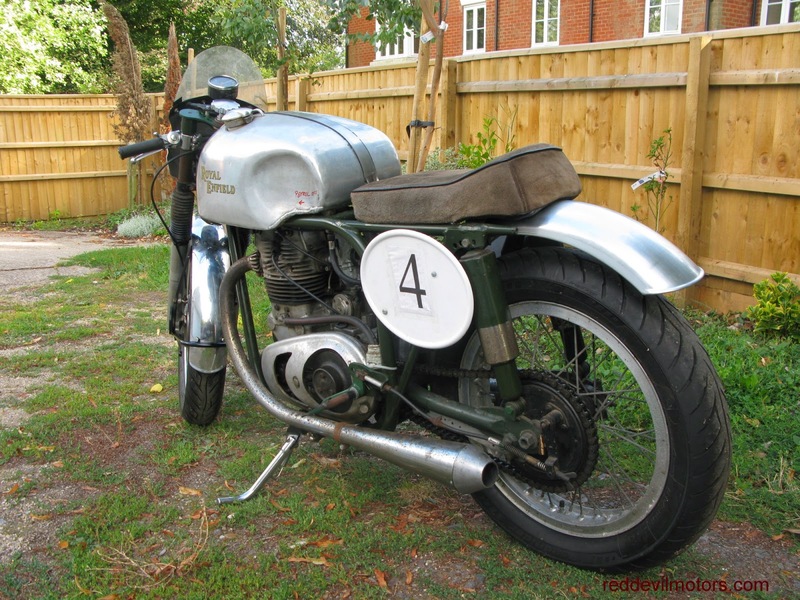 The aluminium Manx style fairing was an ebay spot. I knew it would complement the machine nicely. I also fitted a new, slightly longer rear mudguard as I felt the old one was cut slightly too short. In making changes to the machine I learnt a lesson that what looks good on the bench might not look so good from different angles. I can see that the mounting of the fairing needs some adjustment now it is out of the workshop and also the bike is heavily over-tyred. The front tyre is rather too large a section and could be narrowed down considerably. The bike came to me with a set of flanged ally 19 inch rims so perhaps these are the answer over the 18 inch currently fitted. I think they will probably give it a little more grace. 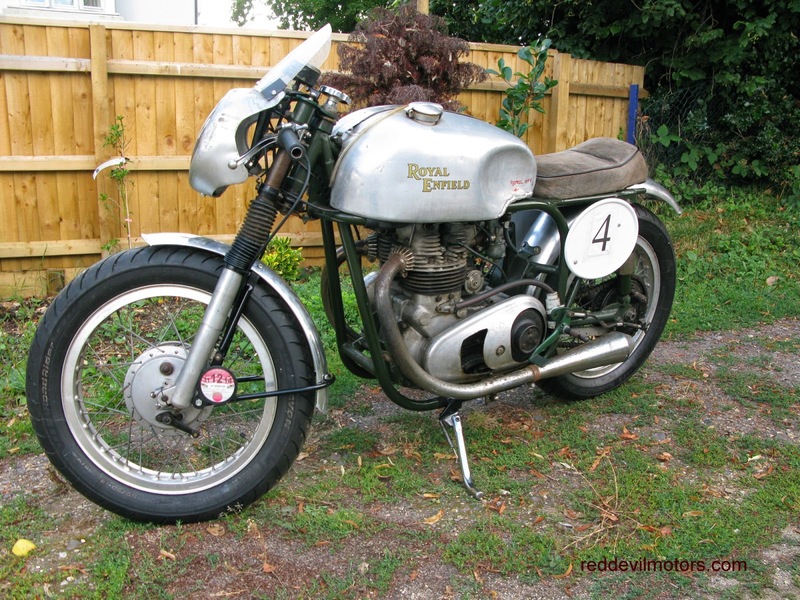 Hopefully the Enfield will be out and about on the streets soon, probably only on special occasions as with no kickstart it's certainly not going to be a daily runner. If you do recognise it and know any more of its story please comment or get in touch via email. concentrics I'll try to go back to the original set-up. 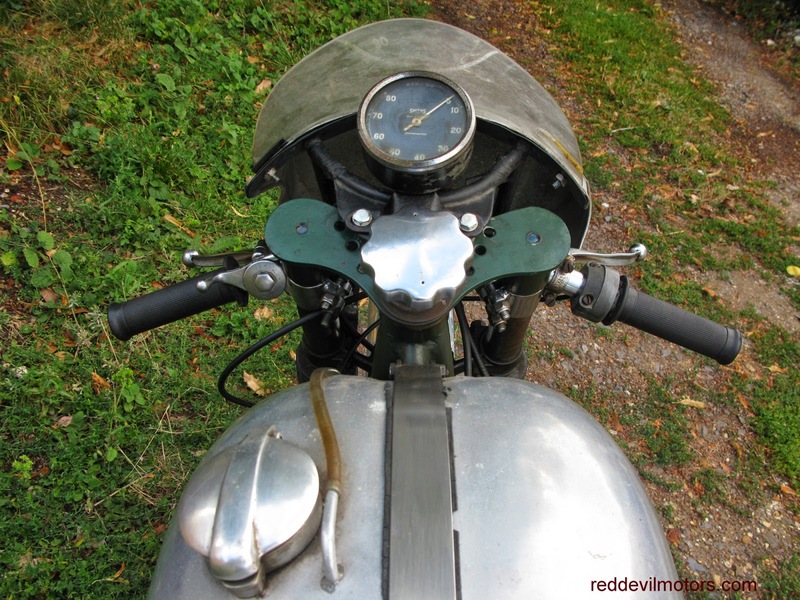 Riders-eye view of the Royal Enfield 500 Twin racer. The latest addition to the bicycle fleet. A 1935 F W Evans. An ebay purchase, I was attracted by the tasty components fitted thinking they could be robbed for another project in the future (pre-war lightweight parts seem to be rocketing up in price at the moment). On seeing the cycle in the flesh I realised that this would be rather criminal as it is such a wonderfully original and high quality machine. The spec includes swan-neck stem and seatpost, fantastic moustache handlebars, Boa pedals, BSA crank, headset and bottom bracket, characterful Constrictor handlebar grips, Constrictor rims, an unidentified and unusual cantilever front brake and a Sturmey Archer three speed hub brake. The Evans arrived in pieces and will soon be sympathetically renovated to a condition I would describe as working but not rideable. ie all parts will be re-fitted and adjusted up properly but the spokes which are slightly delicate will be left alone as will the original 'Parker White Knight' tyres. Bicycles in the shed seem to be multiplying rapidly at the moment and I sense a small cull is needed. I'll post up shortly details of those needing new homes. 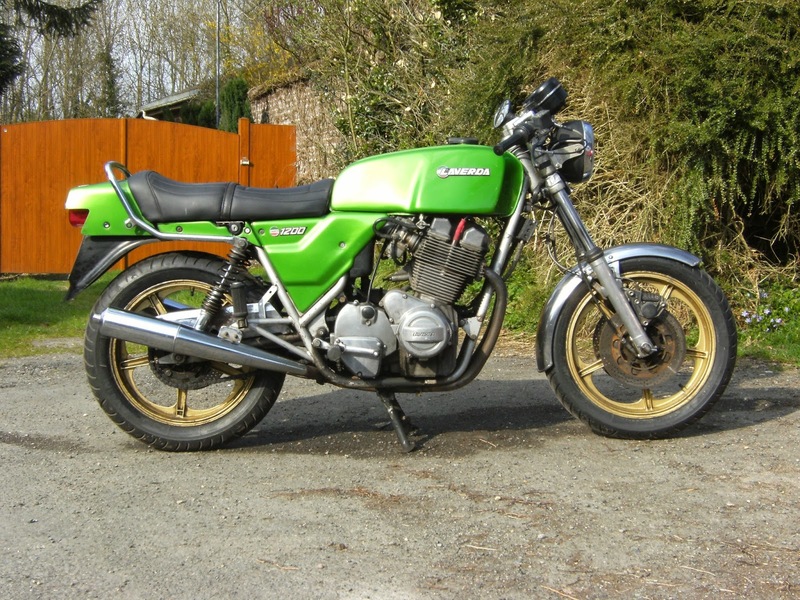 purchase for me and delivering it to Calne Bike Meet. arrived with full touring accessories. F W Evans head transfer. 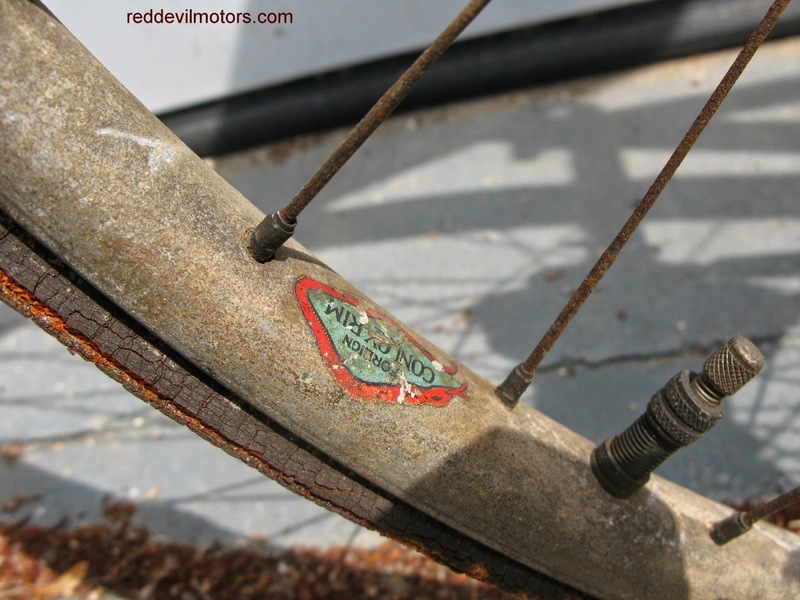 pre-war Parker White Knight tyres. 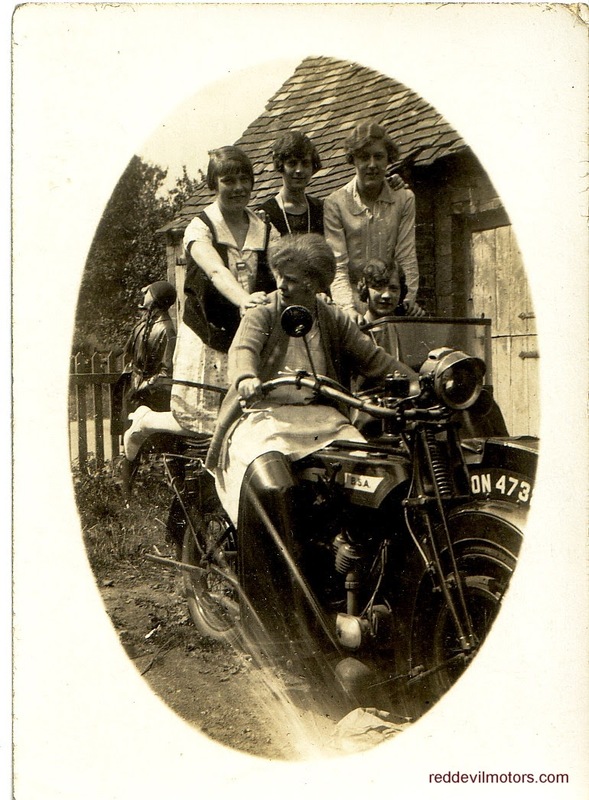 Charming photo of five belles and a BSA v-twin combo. The last unknown bike to get posted got identified within a day. Let's see how this one goes. I really haven't got much of an idea with this one bar that it looks like it is from the late veteran era. The poor quality image doesn't help. Again if you can identify the marque please comment. Another great watercolour from Gie Goyvaerts in Belgium. 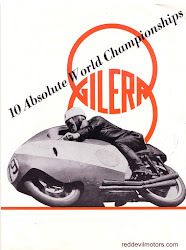 This time a 1939 Moto Guzzi Albarone race bike. As far as I know Albarone is a district of Rome. Gie's email is below. 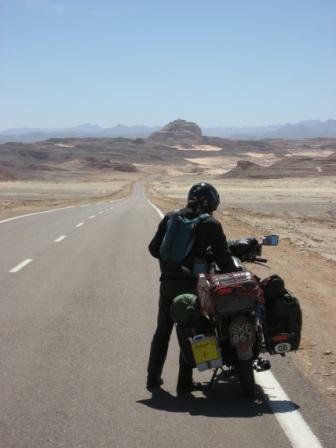 Does anyone recognise this motorcycle? I would guess it is from between 1914 and 1919, the Villiers engine is an easy enough spot but I can't elaborate any further. There's something on the petrol tank but I can't make it out. If you reckon you know what it is please comment. Whatsit? Unidentified Villiers flat tanker. Postscript: thanks to the comment from 'anonymous' that identified the machine as an Ixion. Here's the current bicycle project on the go in the workshop. A late fifties Sun Manxman. Bought as a bare frame and slowly being built up. 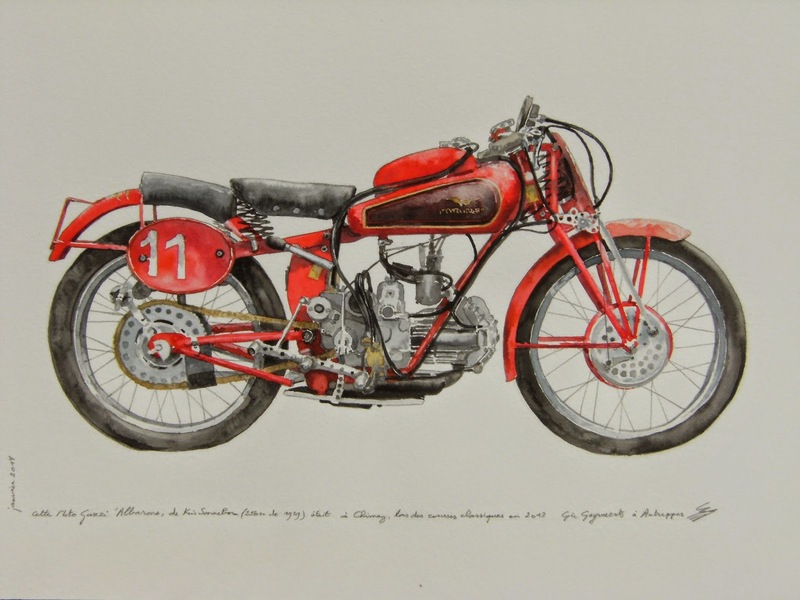 The Manxman was a quality factory built race bike of its day, marketed as a machine for fast touring or massed start racing. 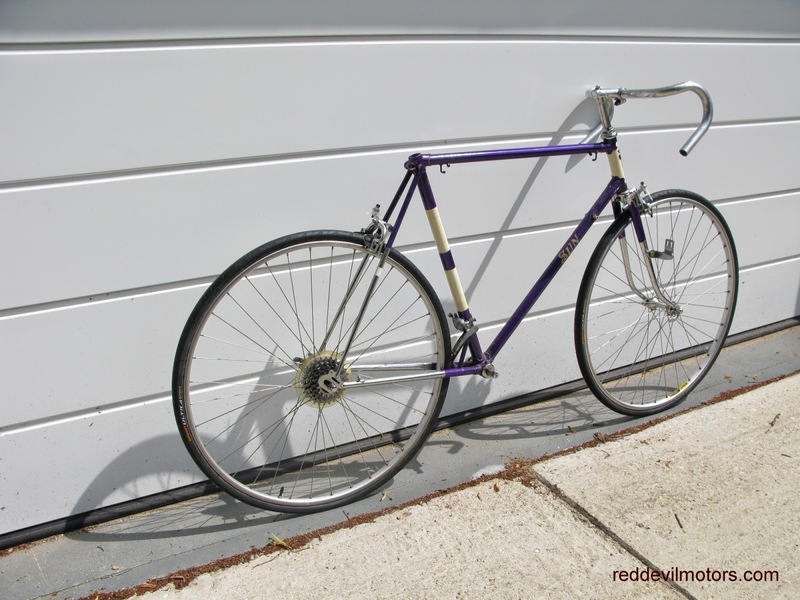 This particular example has been resprayed in a purple / cream combo that is slightly Mercian-esque. I've sourced a pair of 27 1x1/8 wheels, Campagnolo Gran Sport matchbox front mech with matching rear and GB bars and stem. I'm on the search for a suitable cottered double chainset, GB Coureur brake set and Campag Gran Sport bar end levers if anyone can help. 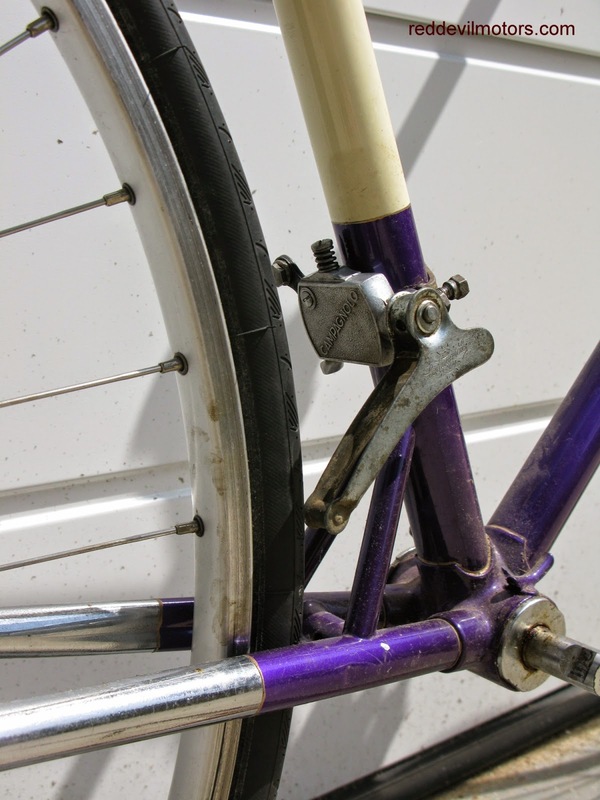 The Campag brakes currently fitted have too shallow a drop and are too recent. 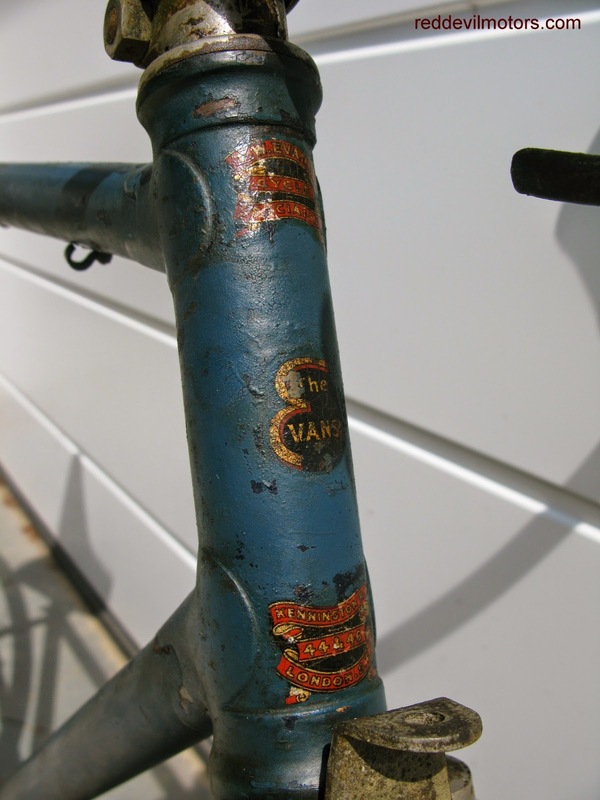 The notable feature of the Manxman's frame is the strutted bottom bracket (a pair of short bracing tubes running from the chainstay to the seat tube). 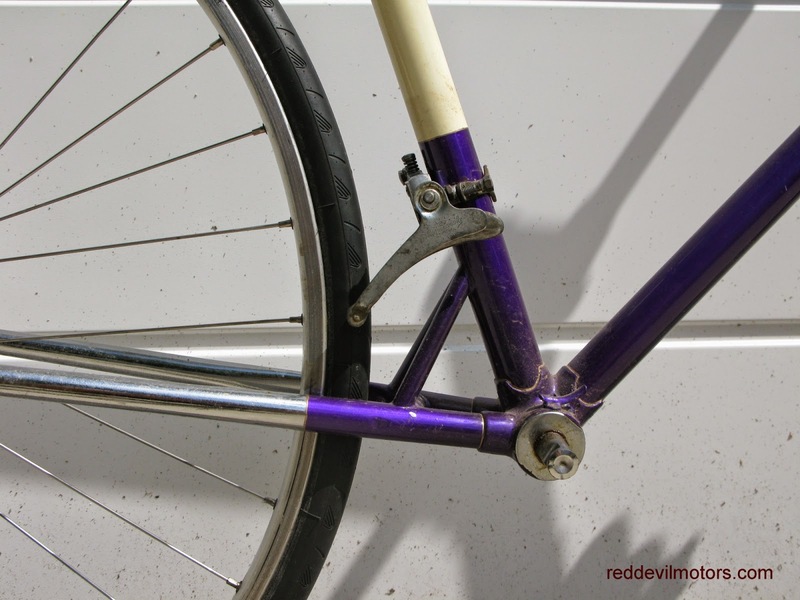 The idea of this was to brace the chainstay on a short wheelbase frame (to shorten the wheelbase the seat tube needed to be sharply angled which necessitated a longer than desirable chainstay). 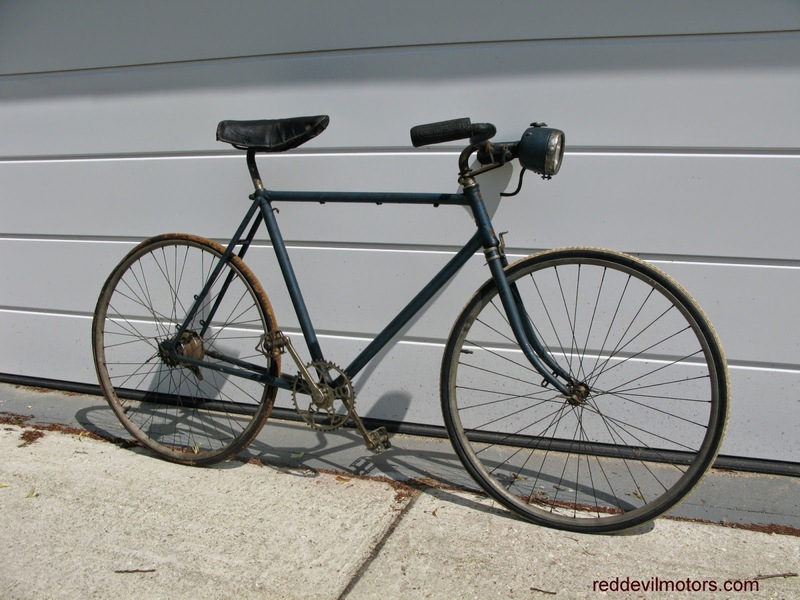 Short wheelbase frames were the fashion when the Manxman was introduced early post war, as time went on you can see that the later frames had a more conventional wheelbase and seat tube angle but the strutted bracket was kept on as a feature. Sun Manxman bicycle taking shape. Another view of the Manxman. 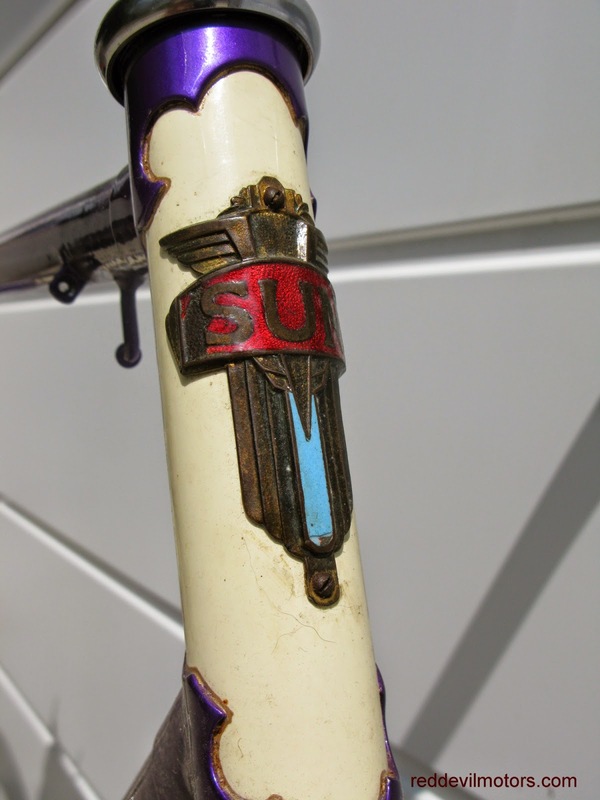 Close up on the Sun's strutted bottom bracket. A couple of great period photos, way better focus and quality than many of the snaps you find from before the war. Unusual subject of a roadside puncture repair too. 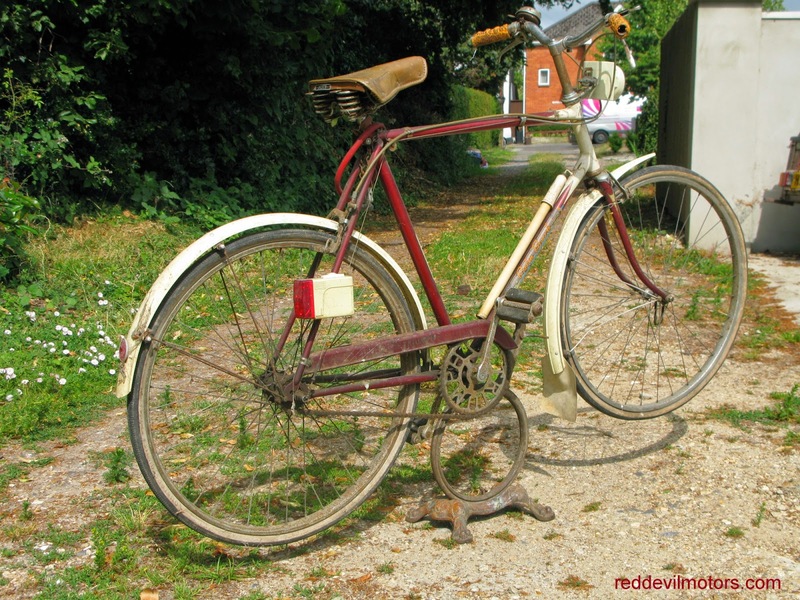 Back in the twenties with beaded edge tyres and unmade roads punctures would be a regular chore for motorists and cyclists. The machine with the flat is certainly a Triumph Model H from the early twenties, a bit hard to identify the other machine in the head on view, probably a Triumph too. condition typical of a minor country road of the period. There're a few forlorn parts kicking around the workshop at the moment that are fashioned from aluminium and suffering grievous injury. 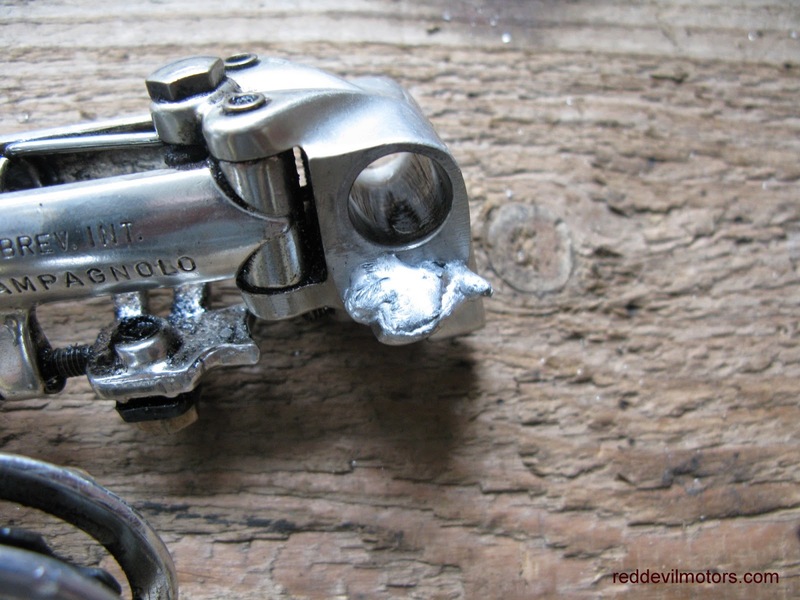 The most piteous of which is a Campagnolo rear mech, its presence haunting as it was I the one who metered punishment to it. I had filed away at it in an attempt to adapt it to fit a Benelux rear hanger. The experiment was unsuccessful and the mech seemed to be useless, too good to throw away and too costly to repair economically. 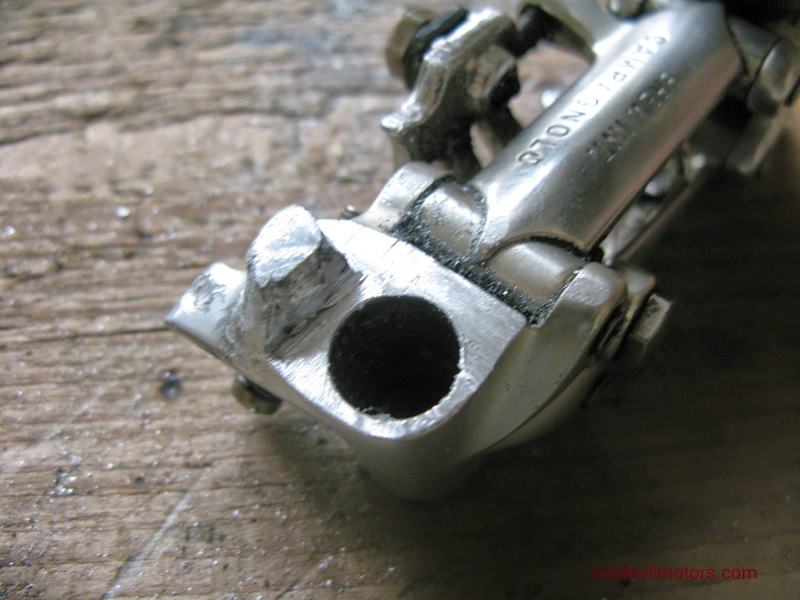 With a couple more projects in mind (in particular the fashioning of a custom bash plate for the Redditch Bullet trials project) it seemed a good idea to try a home repair. There was not really much to lose from the attempt. Lumiweld has been around for a good while and I figured that if it was still on the market it must be at least OK. 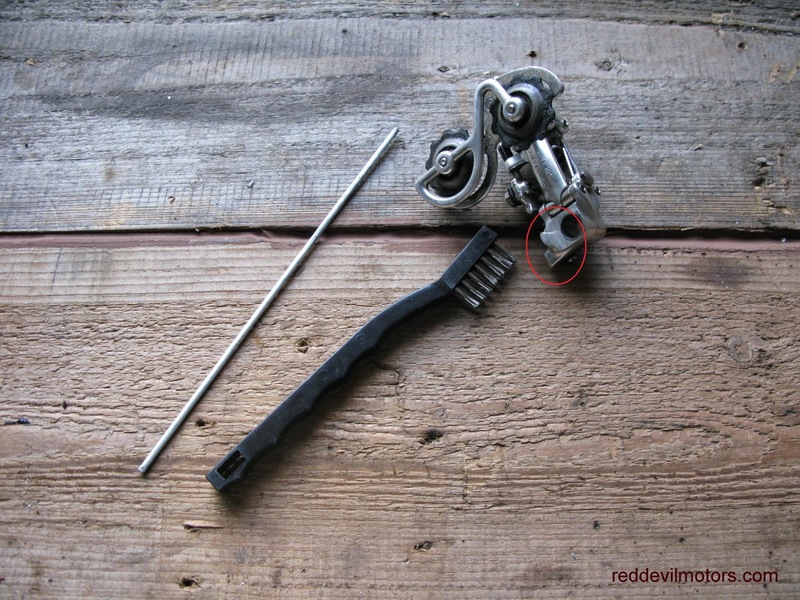 The Lumiweld kit comprises rods, a small wire brush and instructions. The concept is that it makes a fused joint with the rod melting at a lower point than the aluminium surface and the process can be done with a regular blow torch as the heat source. The instructions recommend pre-heating the item to be repaired in an oven, probably a good idea if you have a larger weld to attempt on a big item, but as I was aiming for a small blob to be attached to a small item I decided to go for the blow torch all the way. Also recommended is practising on some scrap first, this I did and the results were good. 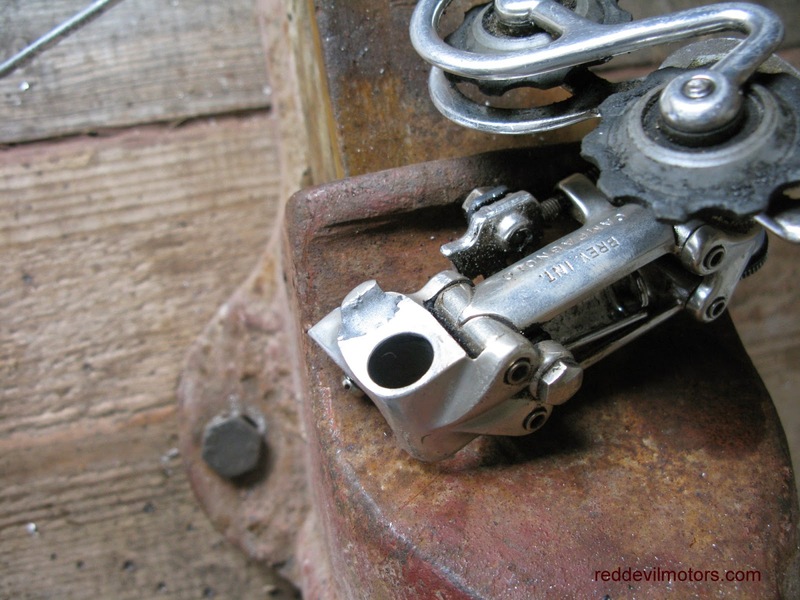 Simply prepare the item to be welded by cleaning it and then giving it a going over with the wire brush. Next step is to heat the item to be welded, you can test the rod against it to see if the temperature has been reached. The instructions recommend 'tinning' the surface as you would with a solder. In fact the whole process is pretty much like soldering and if you are competent at this then you would find lumiwelding easy. The aim of my job was to build up a weld that I could then file down to shape. 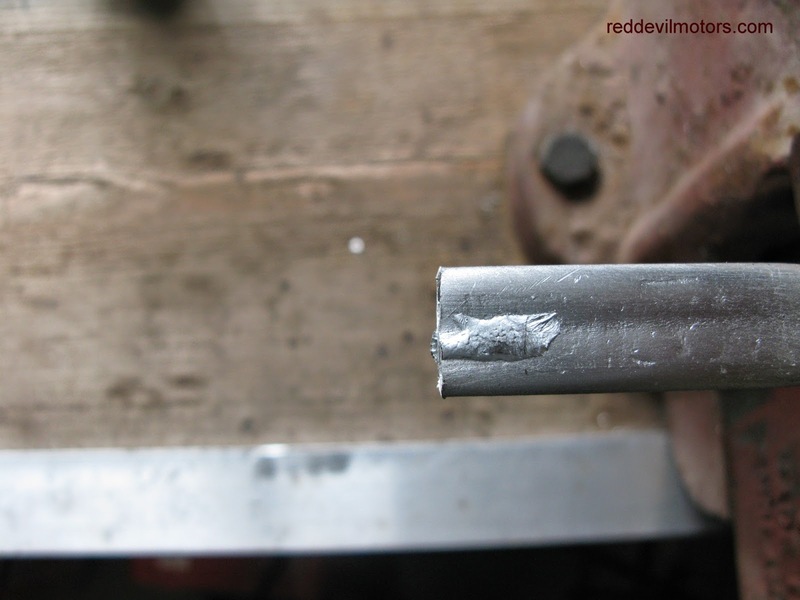 Lumiweld isn't particularly good at this as applying further heat just melts the weld you have already applied. However for a small build up it was successful as the surface tension of the material allows a fair sized blob to grow before it runs. Once cooled down the Lumiweld was found to have fused properly and could be worked just like aluminium. I filed it down and effected a pretty good and barely visible repair. Overall a good product, one that does what it says on the tin and one that will allow easy aluminium repair and fabrication in the workshop. The firs stage - 'tinning' the area to be welded. Beginning to build up the weld. The weld built up and with the filing down to shape just started. Here's another watercolour from Gie Goyvaerts in Belgium. Many thanks Gie for sending in and permission to use on the blog. If you like Gie's paintings and want to get in touch his email is below (it's in image format to fox the spamming scumbags so you will need to type it out). 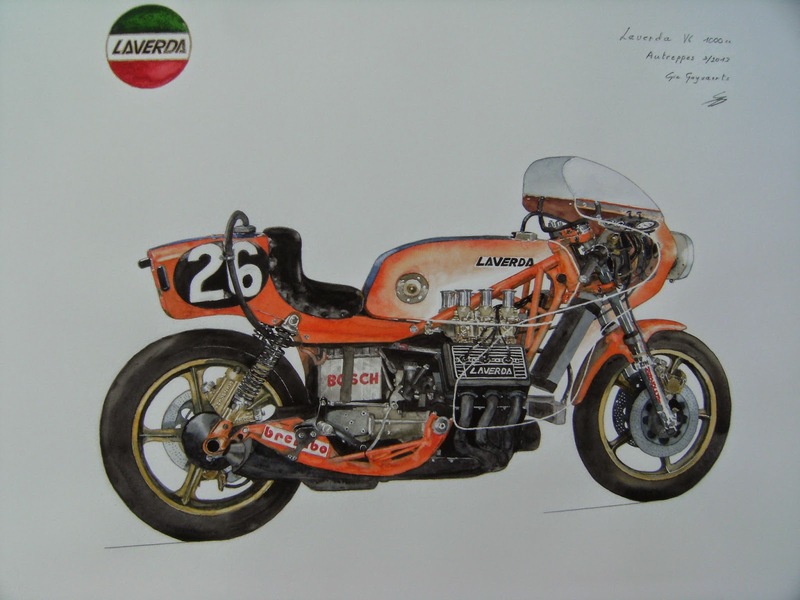 The legendary Laverda V6 endurance racer. just completed a 4000 mile trans-European trip aboard. A card from a packet of Eckstein Nr 5 cigarettes, a German brand around since 1854 and apparently still going on unfiltered as ever. 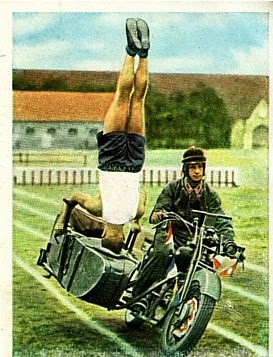 The series was entitled 'Die Deutsche Wehrmacht' and this image of a motorcycle gymkhana seems innocent enough but the set was produced in 1936 and was undoubtedly propaganda for the growing Nazi war effort. 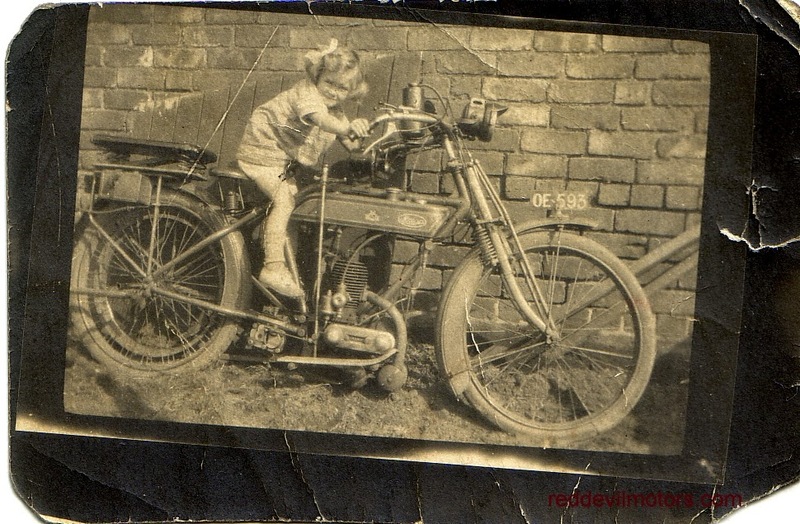 Can anyone identify the bike? 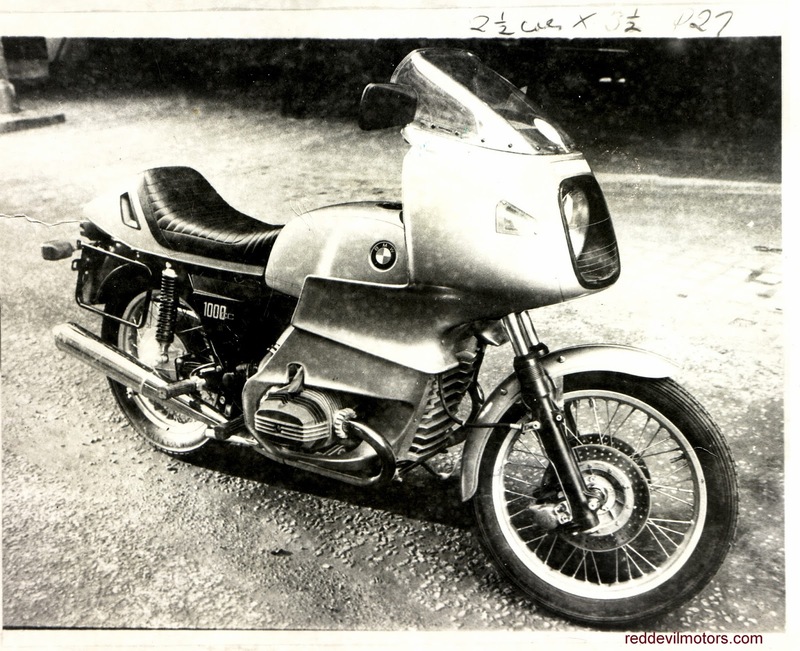 The BMW R100RS was a 1977 model year bike with production beginning late '76. This press photo is from the Sunday Express 5 November 1976. 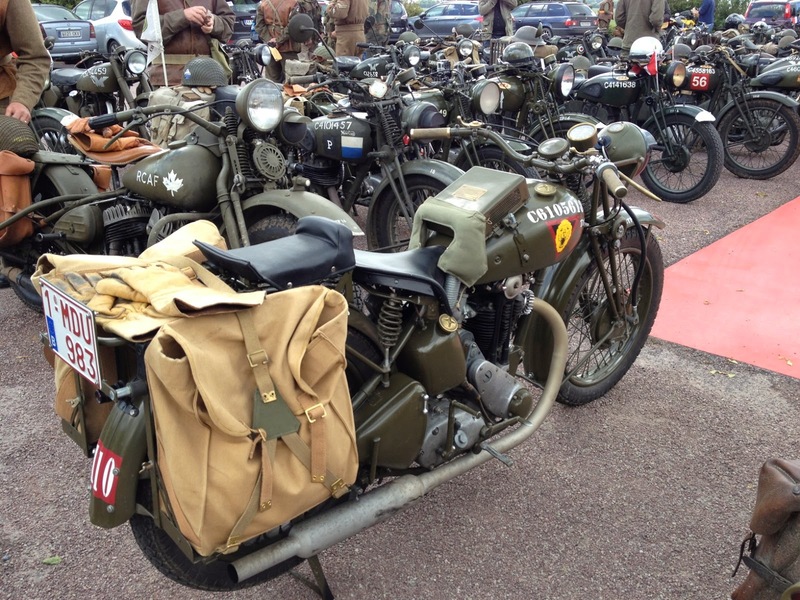 The R100RS was like no previous motorcycle, the mechanics of it were nothing new and faired bikes had been offered before but this was the first of a generation of modern sports tourers. 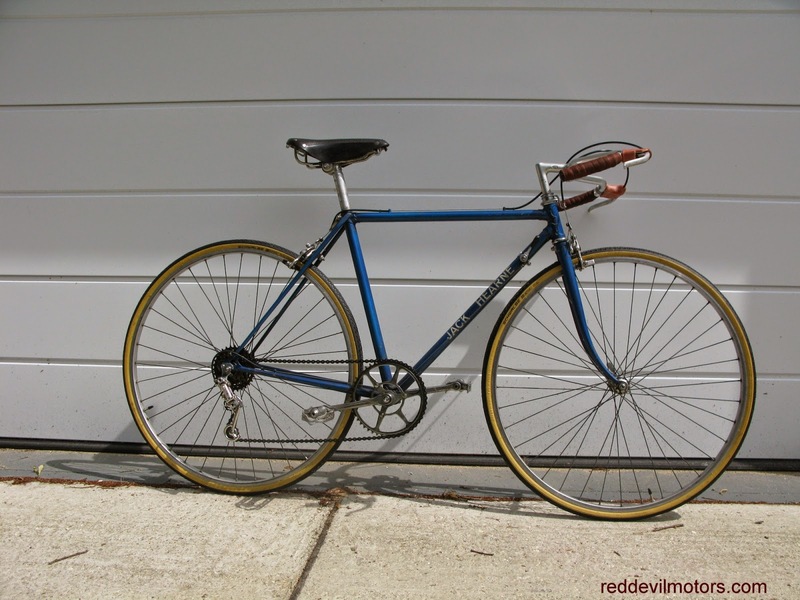 No earlier or contemporary bike could maintain such high cruising speed in comfort and reliability and 38 years on it's still a formidable tool for rapid touring. 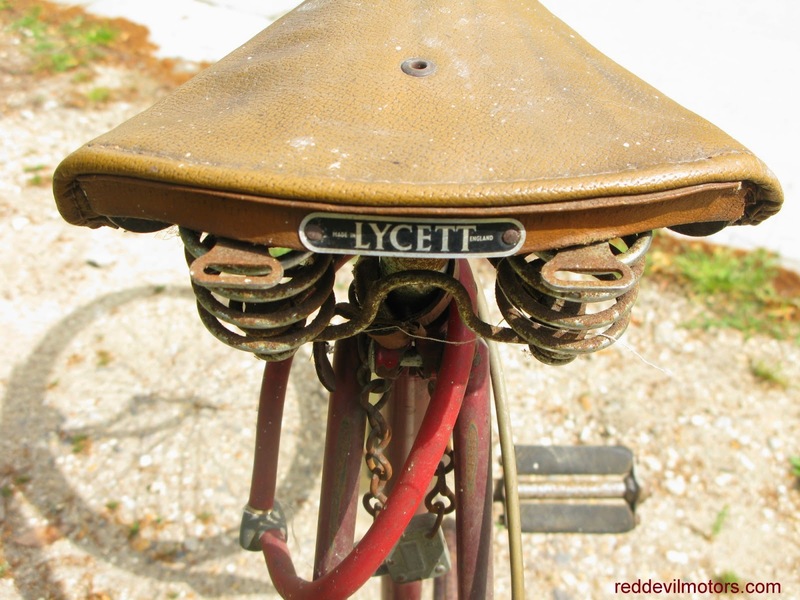 The Elswick Lincoln Imp project was completed with parts robbed from the diminutively framed Jack Hearne cycle. 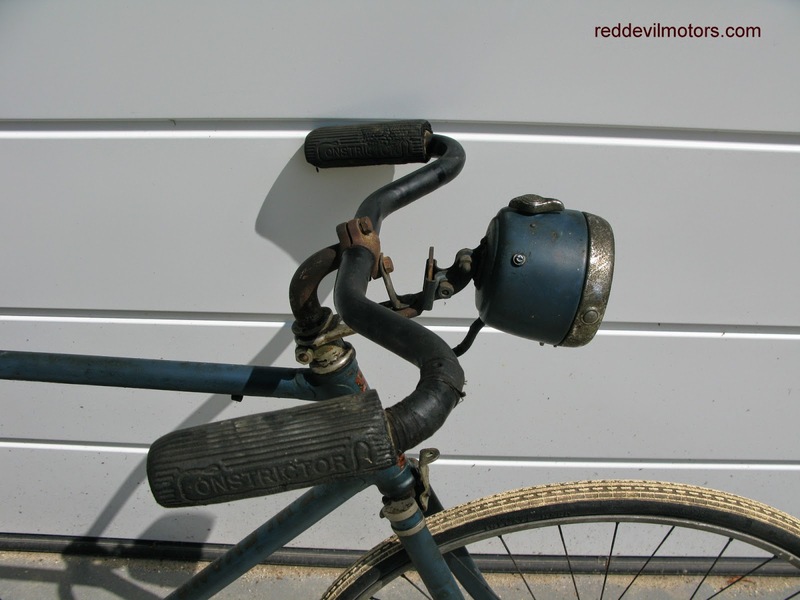 The Hearne lost its wheels to the Imp and given that they were Sturmey Steelite items this meant that the gears and brakes went with them. It was a fair swap as the Sturmey wheels solved several problems on the Imp and the Hearne is better for having 27" wheels. The wheels now fitted are 27" Wolber rims on Campag hubs (Nuovo Record I believe). Braking is taken care of by a set of Mafac Racers which look nice and quirky and are surprisingly effective. 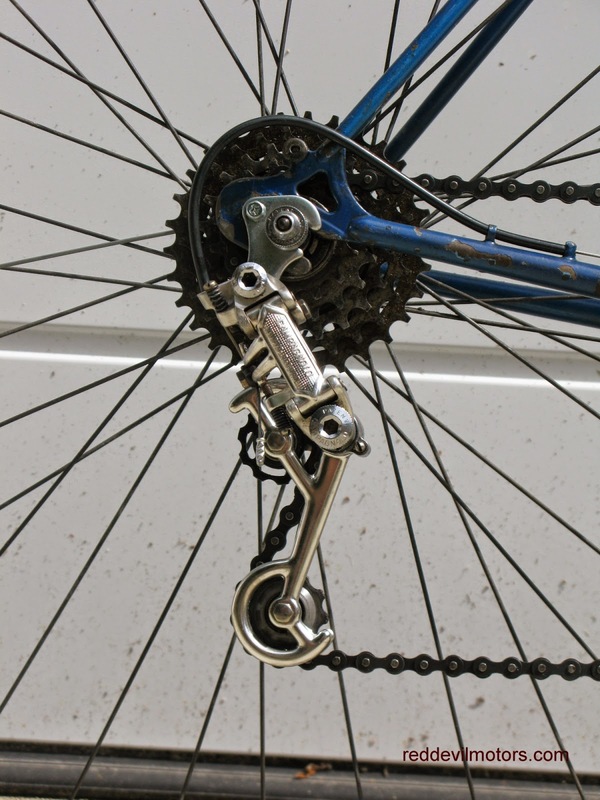 The rear mech is a Campy Nuovo Record changed to Rally spec by fitting a long cage. The end product is satisfying to the eye. I had a brief spin on it and it's a good ride but as I'm six foot two this tiddler isn't going to see many miles with me on board! 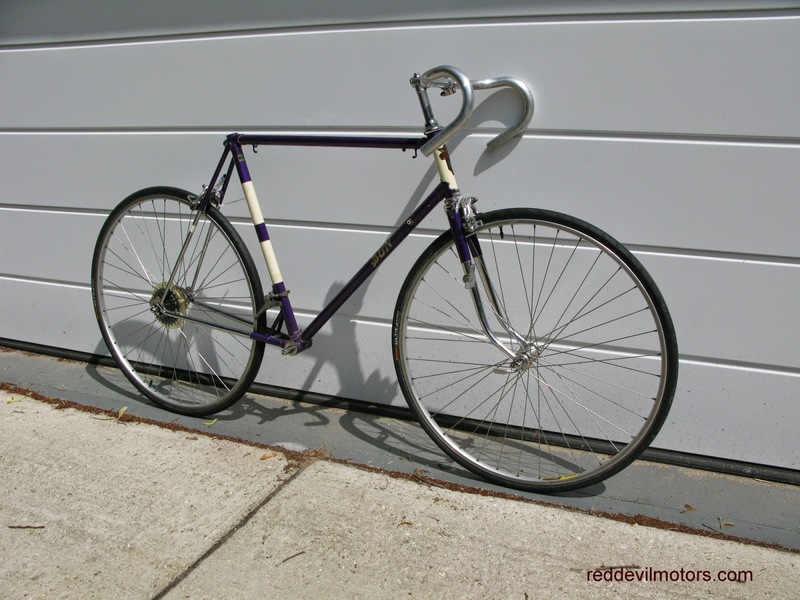 Jack Hearne late sixties frame. Mafac 'Racer' brakes on Jack Hearne frame. You couldn't ever call this a great photo but there is something evocative about it as an image of daily life in times past. 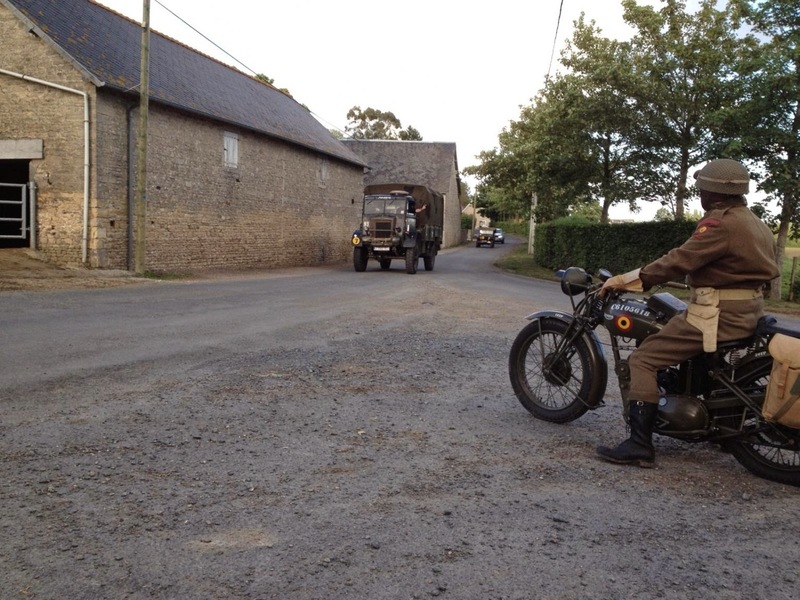 There's a BSA Bantam queueing up alongside a bicycle at the factory gates, I'm reasonably sure it is a Featherbed Norton behind. 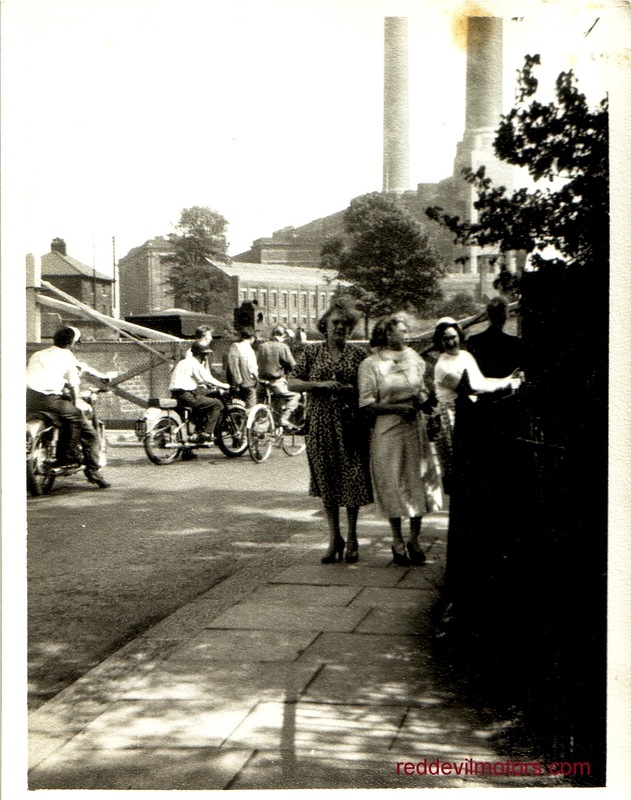 Almost all the factory chimneys have gone now from Britain, along with most heavy industry. It's a summers day and the scene looks almost idyllic though I suspect the working conditions inside were anything but. 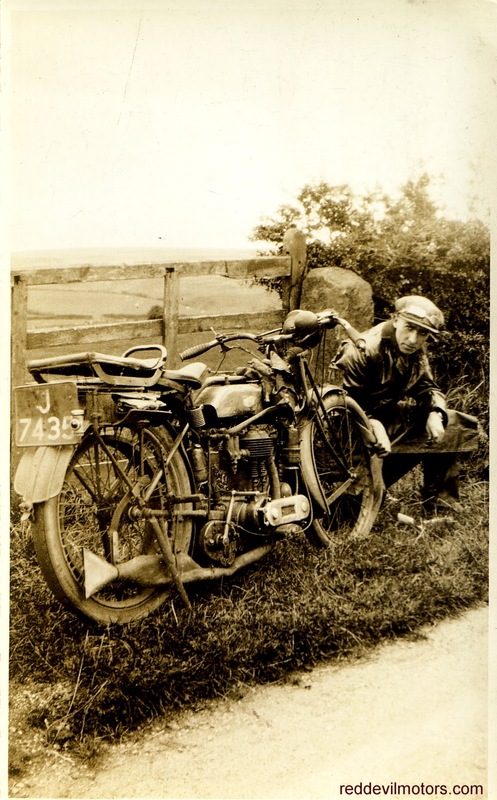 I would have had problems identifying this motorcycle had it not stated 'The Ivy' in large letters across its petrol tank. 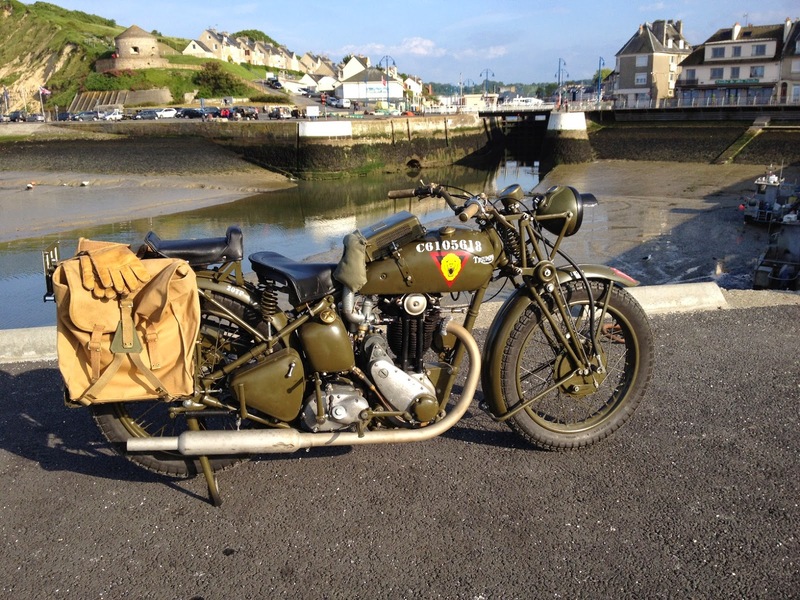 Not sure of the model though, obviously two stroke and from immediately post WW1 I would say. The wheel discs are a great period accessory and very eye catching. 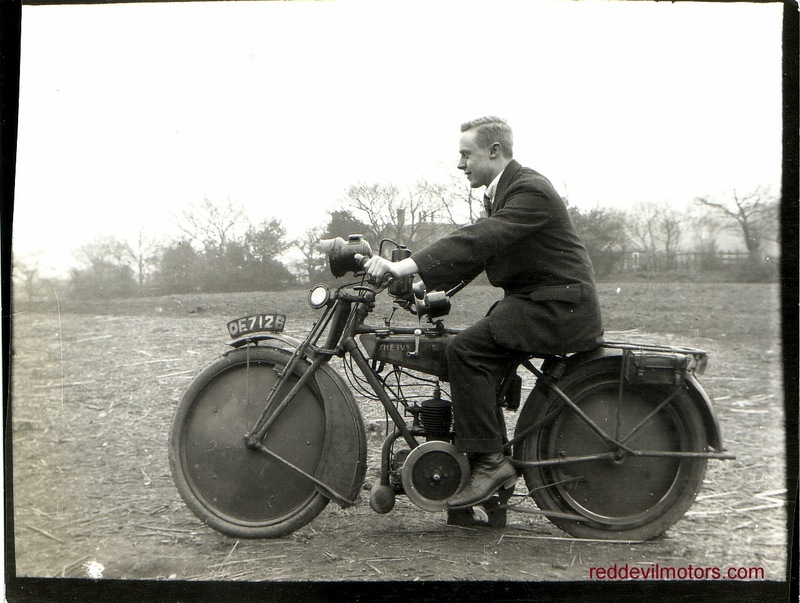 Ivy motorcycles were made from 1910 to 1931 by S A Newman in Aston Cross, Birmingham and used proprietary engines from Precision, JAP, Peco and Villiers. If anyone out there can identify the model and provide more information please do comment or get in touch. wheel discs and tank top klaxon. 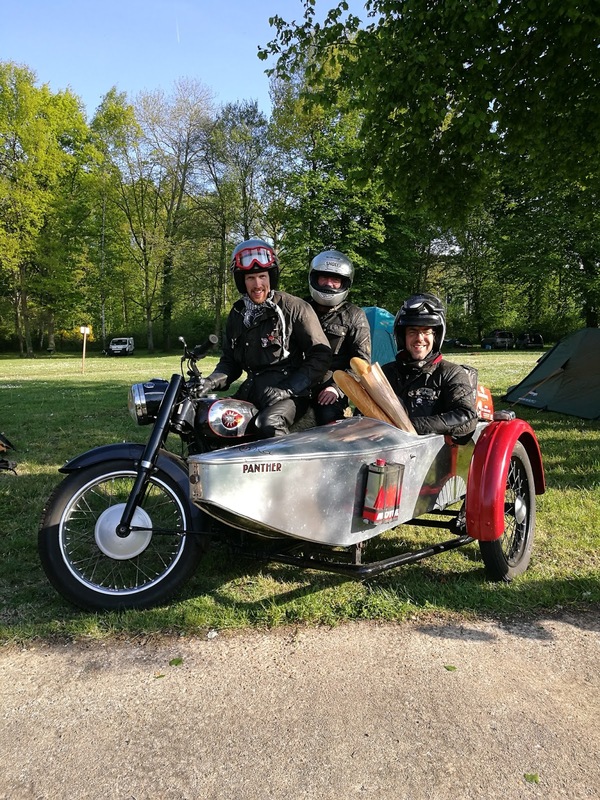 Guy from Belgium was also at Chimay Classic Bikes in July and was similarly taken with the Royal Enfield 700 twin based sidecar racer. So much so he painted a watercolour of it and kindly emailed a copy of the painting across. Guy isn't a commercial artist but he does sell some pictures to help fund maintenance and restoration of his old vehicles. If you are interested get in touch and I'll forward your details. 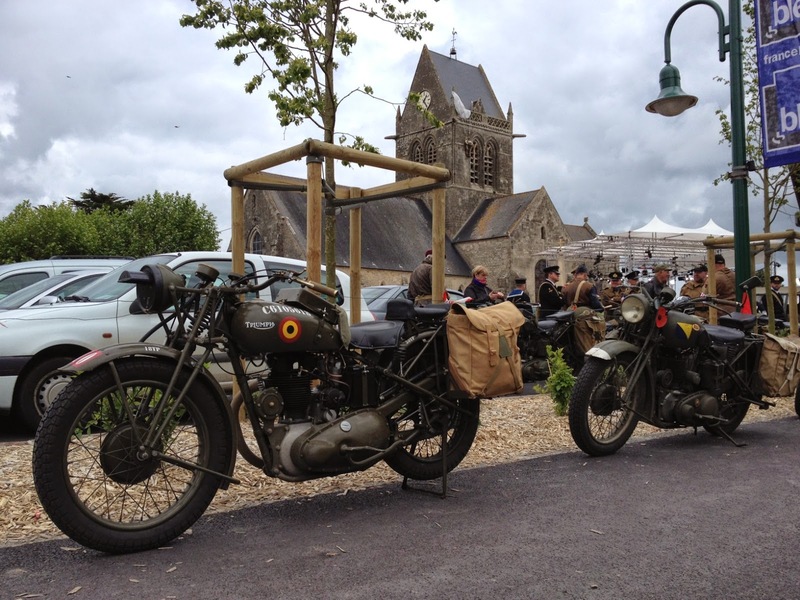 sidecar race bike at Chimay Classic Bikes. This Triumph Palm Beach Tourist was gifted to me by the relatives of an elderly neighbour of my parents who recently passed away. It dates from the late fifties / early sixties, is very original, little used and obviously hasn't seen action for many many years. I've realised that I'm not going to use the bike and as it is so original have made the decision to keep it exactly as it is, I've brushed the cobwebs off but am not even going to oily rag it. 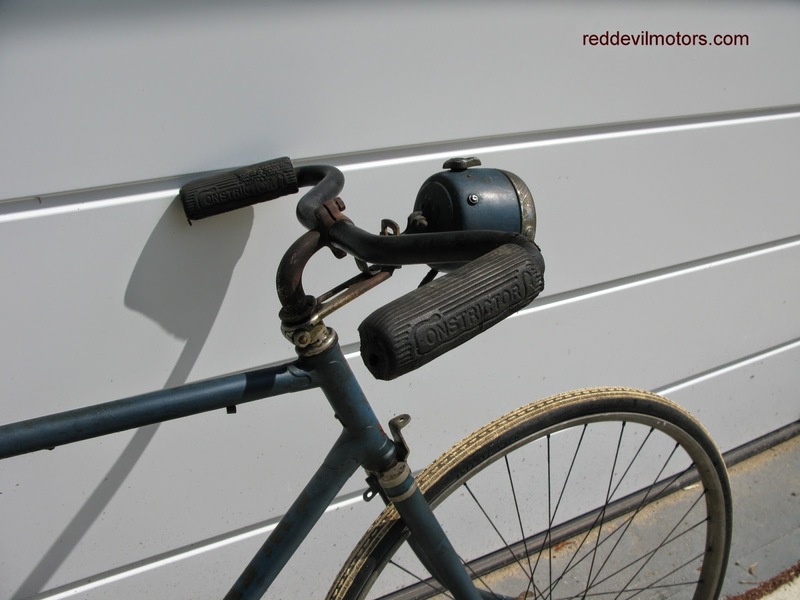 Someone else sometime in the future can renovate it if they want to, I'm going to leave well alone even down to those horrible ugly Eveready battery lights and the two chain locks without keys stuck around the seat post. 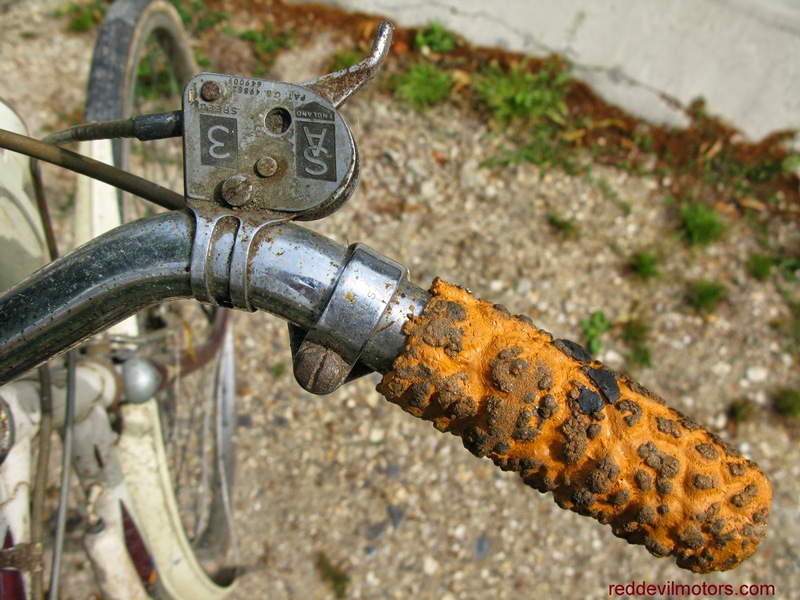 I love the way that time has melted away the original handlebar grips. Triumph cycles were once the same company as the motorcycles. The roots go back to 1885 when a 20 year old German immigrant, Seigfried Bettmann formed the S. Bettmann & Co. Import Export Agency in London buying bicycles from other manufacturers and rebranding them. 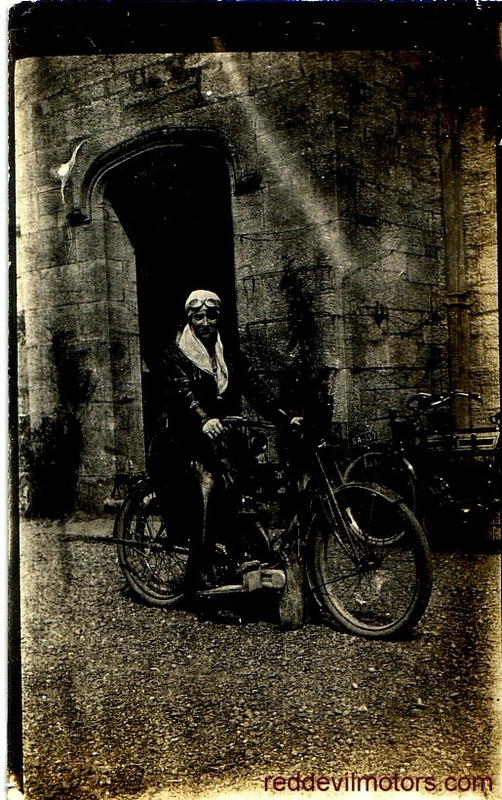 In 1886 the name was changed to the Triumph Cycle Company. The history of Triumph has been written out many times so it isn't worth repeating the job here. Key events cycle-wise though are when Triumph began producing their own cycles in 1889, having bought a factory site in Coventry in 1888. 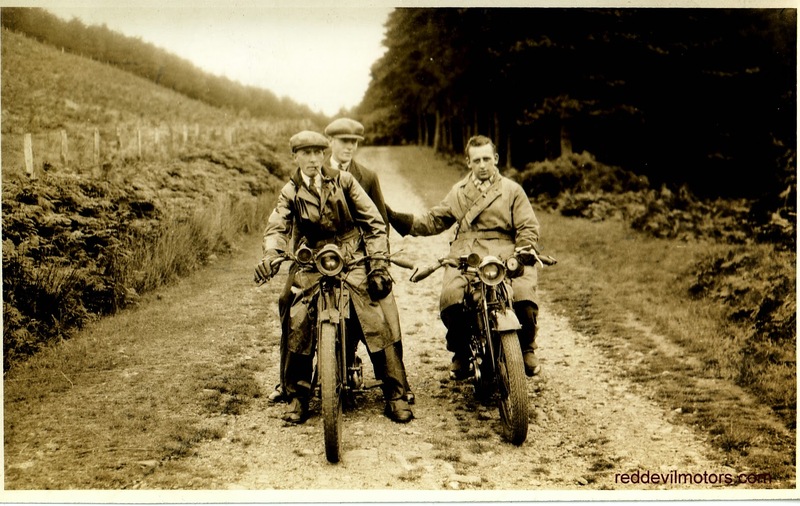 In 1936 during financial difficulties in the depression the cycle division was separated from the motorcycle one and run under different ownership. In 1951 the Triumph Cycle Co Ltd was sold to the Birmingham Small Arms Company, the bicycle arm of which was then sold to Raleigh in 1956. Triumph Palm Beach Tourist downtube transfer. 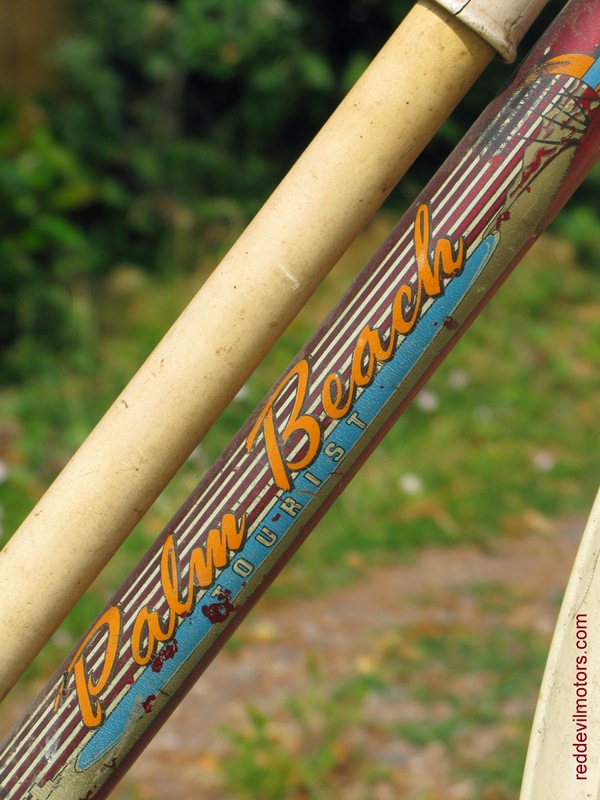 Raleigh Industries produced Triumph Palm Beach Tourist. 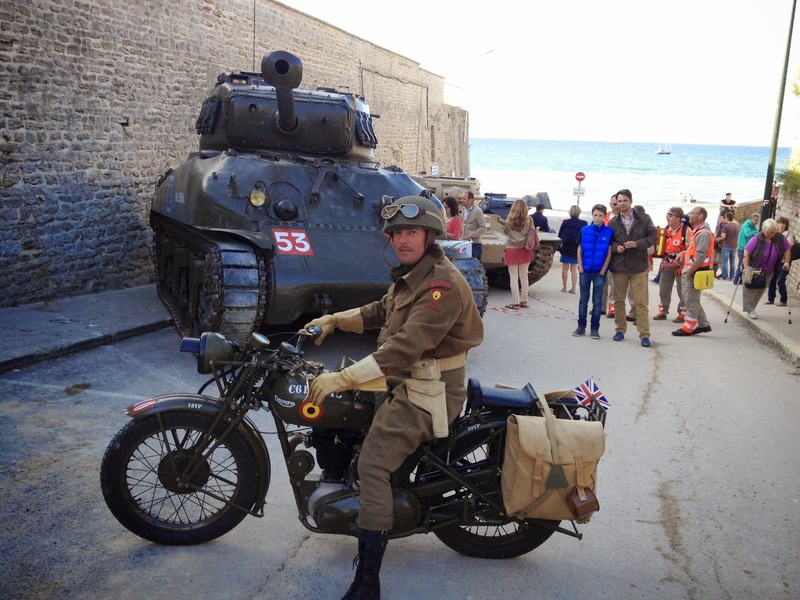 Thanks to Marnic in Belgium for sending in pictures of his freshly restored Triumph 3HW at the recent D Day commemorations. A top job on the restoration, the bike is looking spot on.